Kuhl Waver, under jockey Jose Aguilera, digs in to hold off Spit Curl American in the Altoona Derby(G3) Friday. ALTOONA, IA�OCTOBER 11, 2013�Kuhl Wave dug in and held off a fast closing Spit Curl American Friday night to get her fifth win of the season in the $146,800 Altoona Derby(G3) at Prairie Meadows. Dreaminwideopen put in a solid effort to finish third. A winner of the Merial Araphoe Distaff Challenge against older horses in July, Kuhl Wave covered the 400 yard course as the post-time favorite in :19.685 seconds, a 97 speed index. 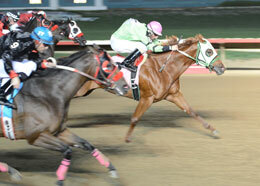 The $58,720 winner's purse swelled her bankroll to more than $151,000. She could make her next start in the $125,000-Guaranteed Merial Distaff Challenge Championship at Los Alamitos on November 9. Jose Aguilera conditions the WAVE CARVER filly for Miguel Banuelos. Bred in Colorado by Tom Bradbury and Marvin Wilhite, the sorrel miss is out of Shazooms Doll, by Shazoom. Raul Ramirez, Jr., had the riding assignment. Spit Curl American almost doubled his earning to $58,173 after pocketing $24,956 for second. Kasey Willis conditions the for Alexia Mehrle. A.C. Taylor is the breeder. The royally bred Dreamnwideopen picked up $14,680 for owner Sam W. Green, Kasey Willis trained the filly ridden by Cody Smith. Sunflower Supply Co. bred the brown miss in Missouri. Completing the field were Hr Ebony Princess, Digthiswagon, Heroes Heart, Pyc First Prize Dash, Girls Dont Seis and Hr Money Maker. Patriots Dream 123 was scratched.